*CONTEMPORARY,ARCHITECT DESIGNED ACCOMMODATION on the WATERFRONT at the COAST situated in a PREMIUM position. *open planned living, dining and kitchen areas all with great lake VIEWS and deck access.The dining table seats 10. *STAINLESS STEEL kitchen with modern appliances(including a dishwasher )& generously stocked with contemporary dinnerware etc. *offstreet parking from a quiet lane at the rear. The Boat House is located 3hrs north of Sydney on the shores of Smiths Lake , one of only 4 houses IN THE MOST DESIRABLE POSITION directly opposite a WHITE SANDY BEACH. 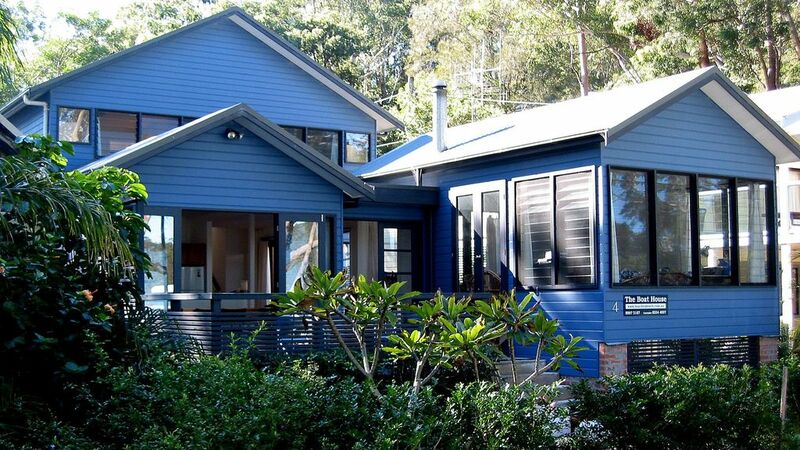 It is part of a small COASTAL VILLAGE in a beautiful, UNSPOILT,rural, forested area known as The Great Lakes which includes STUNNING SURFING BEACHES, lakes and National Parks and is 20 minutes south of Forster. This is a rare COASTAL location where the forest meets the sea and offers a real SEACHANGE experience with no highrise or unit developments. *Smiths Lake is separated from the sea by a sandbar and offers SAFE swimming, boating, water sports and fishing with direct LEVEL access in front of the Boat House via a white sandy beach and a boat ramp. *At the waters edge is the Frothy Coffee Boatshed Cafe(boat hire,coffee,light meals) and nearby,a childrens playground. *5 to 10 minutes away are some of the most spectacular BEACHES in NSW including Blueys,Boomerang and Elizabeth. *the closest beach, Cellitos, has access from a carpark via a boardwalk through coastal rainforest, but locals go by boat! * Seal Rocks LIGHTHOUSE with its panoramic VIEWS and beautiful beaches is a short drive away. Awesome location and equally awesome house!! The house was really clean and the kitchen was well stocked with every thing you would need and more. Beds were comfy and plenty of room overall. Especially loved the table that seated 10 comfortably. We had a great weekend and would definitely recommend this house. Wonderful house in a stunning location! The Boat House is a beautiful house, perfect for relaxing getaways with the family. The louvre windows throughout meant that we had a lovely breeze whenever we wanted. Situated in the perfect spot to overlook the lake and walk for coffee. We had a fantastic time and appreciated having the space to each do our own thing. We will definitely be back again soon! A home away from home with everything you could need. We really enjoyed our stay at the Boat House. We have been going to the boathouse for 12 years which says it all. It is the best property in Smiths Lake. Every convenience has been thought of and the owner goes out of her way to make your stay wonderful. An amazing property! Everything you need to make your stay comfortable and a little bit more. From booking to check out we felt welcome and cared for. Location is spot on with the park across the road for the little ones and coffee for the big kids within shuffling distance. Thank you for a wonderful weekend. We were surprised at how close everything was in terms of a cafe only metres away, the lake, nearby towns and the house itself was unbelievable with a great little fire for winter. Will definitely look to come back here again! !